The posterior triangle of the neck is an anatomical area located in the lateral aspect of the neck. In this article, we shall look at the anatomy of the posterior triangle of the neck – its borders, contents, subdivisions, and any clinical relevance. 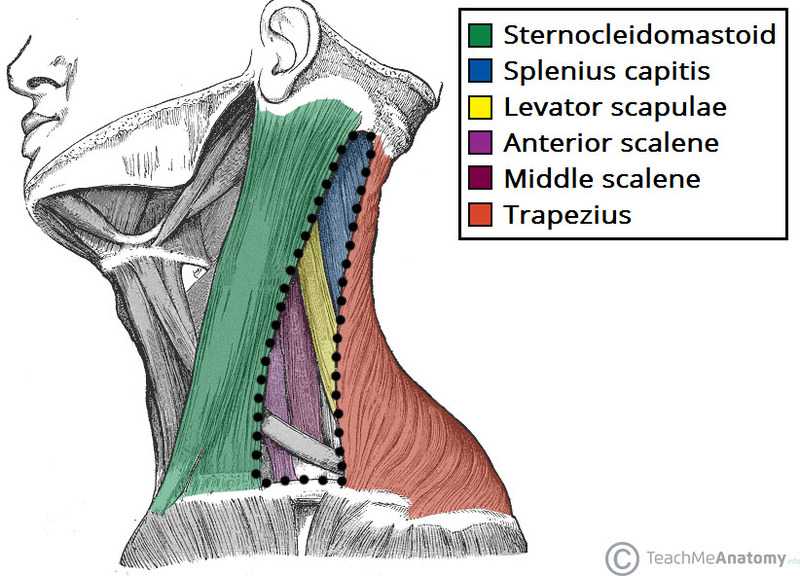 Anterior – posterior border of the sternocleidomastoid. Posterior – anterior border of the trapezius muscle. Inferior – middle 1/3 of the clavicle. The posterior triangle of the neck is covered by the investing layer of fascia, and the floor is formed by the prevertebral fascia (see fascial layers of the neck). Fig 1 – The borders and floor of the posterior triangle of the neck. The posterior triangle of the neck contains many muscles, which make up the borders and the floor of the area. A significant muscle in the posterior triangle region is the omohyoid muscle. It is split into two bellies by a tendon. The inferior belly crosses the posterior triangle, travelling in an supero-medial direction, and splitting the triangle into two. The muscle then crosses underneath the SCM to enter the anterior triangle of the neck. The external jugular vein is one of the major veins of the neck region. Formed by the retromandibular and posterior auricular veins, it lies superficially, entering the posterior triangle after crossing the sternocleidomastoid muscle. Within the posterior triangle, the external jugular vein pierces the investing layer of fascia and empties into the subclavian vein. The subclavian vein is often used as a point of access to the venous system, via a central catheter. The subclavian, transverse cervical and suprascapular veins are accompanied by their respective arteries in the posterior triangle. The distal part of the subclavian artery can be located as it emerges between the anterior and middle scalene muscles. As it crosses the first rib, it becomes the axillary artery, which goes onto supply the upper limb. The external jugular vein has a relatively superficial course down the neck, leaving it vulnerable to damage. If it is severed, in an injury such as a knife slash, its lumen is held open – this is due to the thick layer of investing fascia (for more information see Fascial Layers of the Neck). Air will be drawn into the vein, producing cyanosis, and can stop blood flow through the right atrium. This is a medical emergency, managed by the application of pressure to the wound – stopping the bleeding, and the entry of air. The accessory nerve (CN XI) exits the cranial cavity, descends down the neck, innervates sternocleidomastoid and enters the posterior triangle. It crosses the posterior triangle in an oblique, inferoposterior direction, within the investing layer of fascia. It lies relatively superficially in the posterior triangle, leaving it vulnerable to injury. The cervical plexus forms within the muscles of the floor of the posterior triangle. A major branch of this plexus is the phrenic nerve, which arises from the anterior divisions of spinal nerves C3-C5. It descends down the neck, within the prevertebral fascia, to innervate the diaphragm. Other branches of the cervical plexus innervate the vertebral muscles, and provide cutaneous innervation to parts of the neck and scalp. The trunks of the brachial plexus also cross the floor of the posterior triangle. Figure 2 – Nerves within the posterior triangle of the neck. For anaesthesia of the neck area, a cervical plexus block can be used. Local anaesthetic is injected along the posterior border of sternocleidomastoid at the junction of its superior and middle thirds. 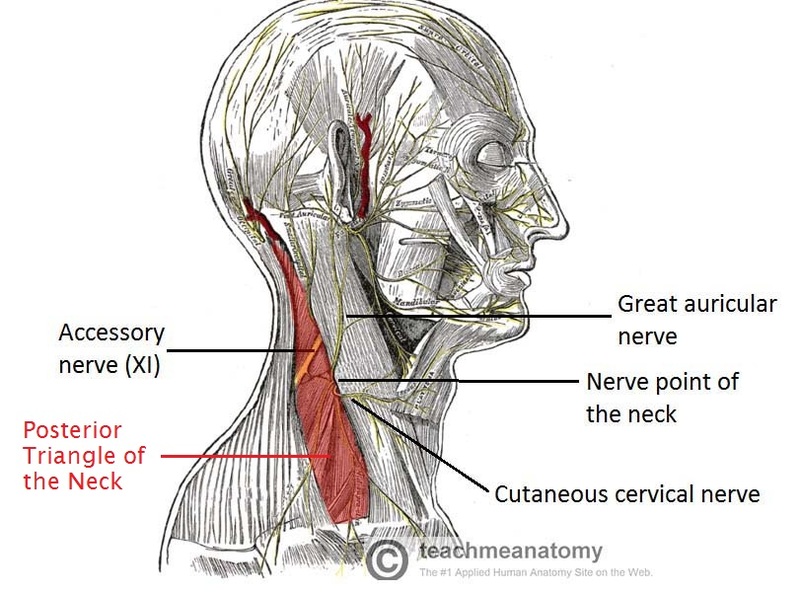 This junction is where the cutaneous branches of the cervical plexus emerge, known as the nerve point of the neck. The larger, superior part is termed the occipital triangle. The inferior triangle is known as the subclavian triangle and contains the distal portion of the subclavian artery. 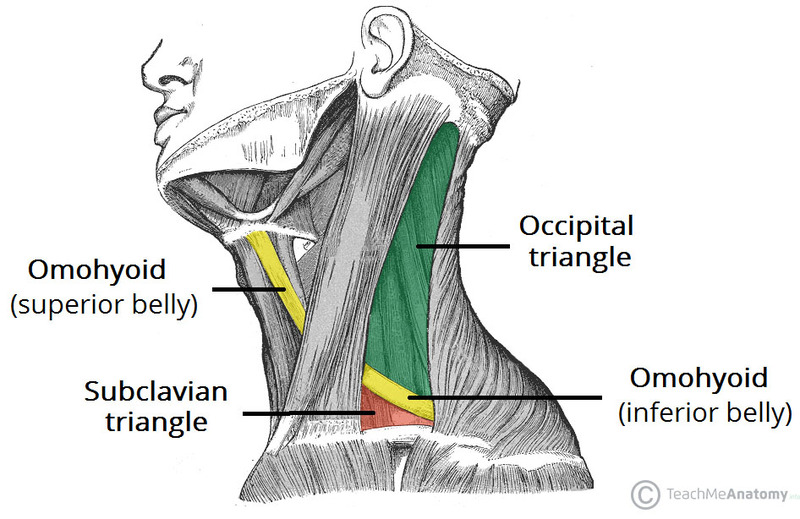 Fig 3 – The posterior triangle is divided by the inferior belly of the omohyoid into the occipital and subclavian triangles. What structure forms the anterior border of the posterior triangle? Which muscle divides the posterior triangle into two? Which of these blood vessels is NOT found in the posterior triangle?